Join us for a fun and relaxing tour on Saguaro Lake, situated between the rugged Superstition Mountains and the towering Four Peaks. 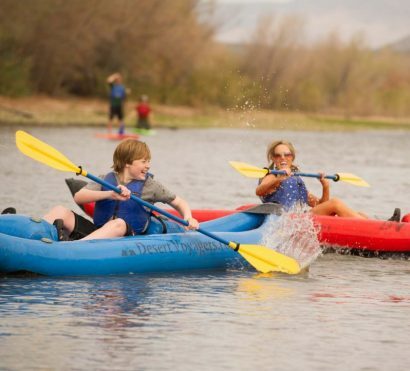 Try your hand at either paddling an inflatable kayak or balancing and manuevering a stand-up paddle board. Participants may opt to trade watercraft with each other mid-tour or stick with one discipline. This scenic desert reservoir provides habitat for many important species of wildlife such as bald eagles, desert bighorn sheep, and numerous examples of reptiles and amphibians. It is also one of the foraging area of the famous Salt River horses, which are frequently seen along the shores. This tour is suitable for all ages and ability levels. No previous experience is required. Let us know in advance if you’d like an inflatable kayak or a stand-up paddle board for your adventure! Comfortable, weather appropriate athletic clothing – shorts and a t-shirt, bathing suit, on cooler mornings long sleeves are advised. We recommend bringing a dry change of clothes for after your kayaking trip. These must stay on your feet at all times – sport sandals only please. Flip flops or bare feet are not allowed. Sunglasses, sunscreen, camera, lip balm, medications, hat, etc. $200 per group. No other parties may add to your tour. We can schedule private tours any day of the week. Tours, rentals, and add-ons may be subject to sales tax at the local rate. Check out our Specials and Discounts page for seasonal offers or to purchase as gift card! You will meet at our office in North Scottsdale a few minutes before your scheduled departure. Once you’ve booked your tour you will receive a booking confirmation email with details on the time and date of your tour, where to meet, the cancellation policy, a receipt of your tour purchase, and requests from us if we need additional information. You can expect to be with another group on your kayak tour unless you have booked a private tour. If you are staying in the east valley near Mesa, please call our office if you would like to meet at an alternate location of greater convenience. 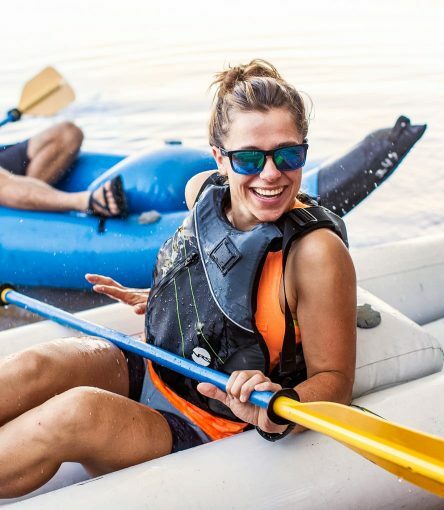 Our guided Lake Kayaking and SUP (stand up paddle board) tour is a perfect beginner-friendly introduction to two exhilarating forms of recreation. The tour uses inflatable kayaks and SUPs, which are similar to a surf board. Guests will have the opportunity to use both types of equipment throughout the tour to learn the basics of each sport. 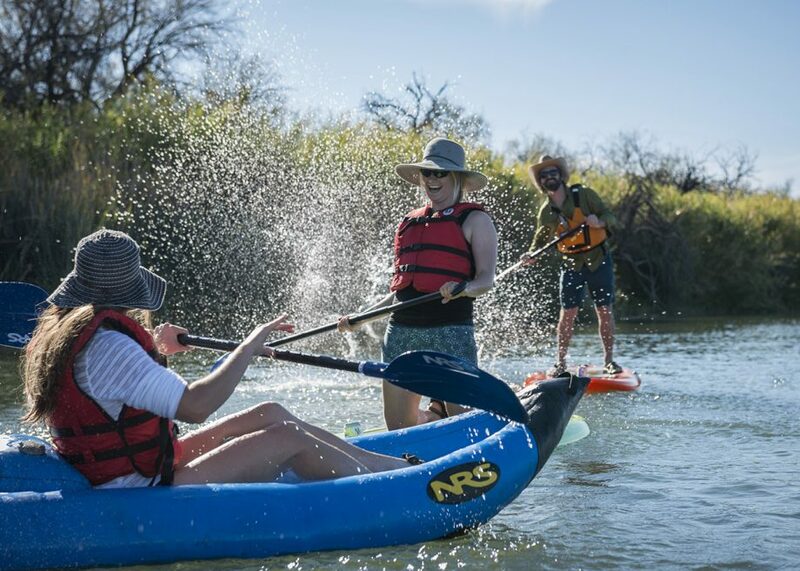 The inflatable kayaks are stable and easy to maneuver, creating the perfect platform for splashing, relaxing, or wildlife viewing. The SUPs offer a more playful technique, and even those with no prior experience within no time can learn the skills to soon be balancing, kneeling, or standing on the board. The lake is an indispensable oasis in the vast Sonoran Desert, attracting a multitude of birds and wildlife – we often see desert bighorn sheep and bald eagles during our tours! Take the time to appreciate the surrounding mountain peaks, giant saguaro cactus, and flora unique to this ecosystem. Your guides are always available to teach you the natural history of the area and give you expert paddling instruction. 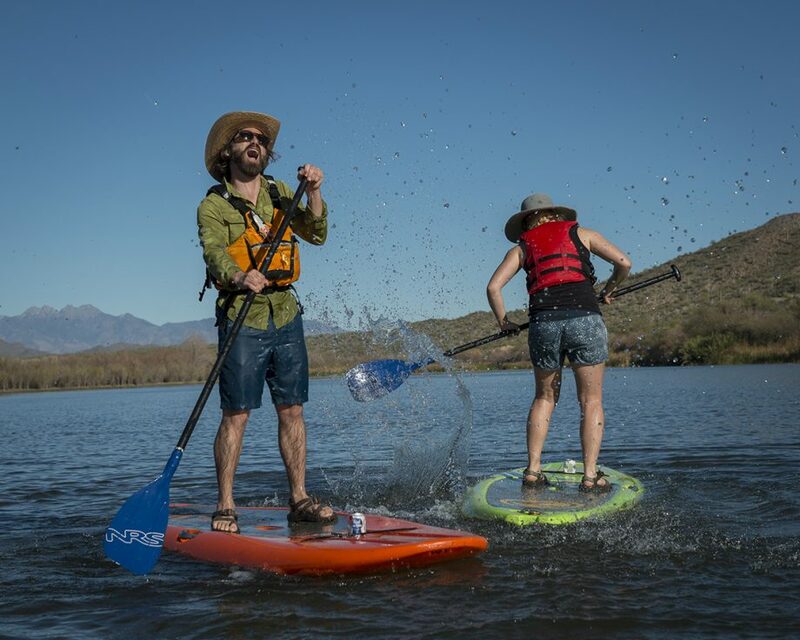 All of our regularly scheduled lake kayak and paddle board tours take place at Butcher Jones Recreation Site at Saguaro Lake. We can operate tours at Canyon Lake, Bartlett Lake, and Lake Pleasant on request. We have a number of put‐in/take‐out locations and select our launch locations based on the current lake level to provide you with the best experience. Water temperatures vary from the 60s in the winter to low 80s in the summer months. Swimming is possible year‐round but it can be a bit bracing in January! All tours depart from the AOA office in north Scottsdale and travel 35 minutes to our tour location just outside the eastern metro area.